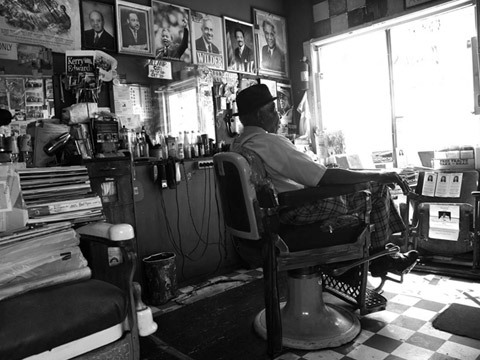 Mr. James Armstrong is a rank and file “foot soldier” and the proud proprietor of Armstrong’s Barbershop, a cultural and political hub in Birmingham, Alabama, where hair was cut, civil rights marches organized and battle scars from police truncheons iced. This film follows eighty-five-year-old Mr. Armstrong, as he experiences the manifestation of an unimaginable dream: the election of the first African American president. This colorful and courageous activist of the Civil Rights era casts his vote, celebrates Obama's victory and proudly unfurls the American flag he carried across the Edmund Pettus Bridge as he is inducted into the Foot Soldiers Hall of Fame. Mr. Armstrong links the magnitude of the present paradigm shift with challenges he faced in the past: from his sons' integration into an all-white school to the Bloody Sunday march for voting rights. Gail Dolgin was dedicated to the documentary form as a way to impact the world, both as an artist and an activist. She has linked her commitment to justice with her love for filmmaking since the 1960s and chose to collaborate with Robin Fryday to tell Mr. Armstrong’s story knowing, that after years of battling breast cancer, this would be her last film. Robin Fryday is a photographer based in Marin County. Her career as a child photographer spans almost twenty years and is intricately linked to a commitment to use her work to help underprivileged children. Robin’s awareness of a growing need for foster and adoptive families in the Bay Area led her to co-found and co-chair The Bay Area Heart Gallery, a collaboration between photographers and public and private child adoption agencies. Her desire to use her photography skills to assist children in need inspired her visits to several developing nations, where her photographs were used to raise money for non-profit agencies designed to feed and school the impoverished in Peru, India, Bhutan, and most recently, Haiti.